Now that I’m back in the north country and (almost) recovered from the various traumas of my trip, I feel a hole in my heart. You might ask why, and the answers could be varied. Am I aching for the beauty of the rolling hills? Am I missing the robust splendour of our rental SUV? More appropriately, is my soul halved from being separated from the friends I made? Yes, a definite yes to all of the above. But the biggest emptiness comes from the lack of one divine thing that I’m wont to find anywhere else. On my first trip to Kentucky, I was vegetarian, leaving me few choices for sustenance aside from white bread and this one place that had a decent salad. I was tired, worn out, and damn hungry to boot. At ends, I entered a little roadside food shack and scanned the menu with the barest glimmer of hope. I was about to despair and succumb to the call of a BLT when I spied the holy grail: the pickle that is fried and served with a side of ranch dressing. 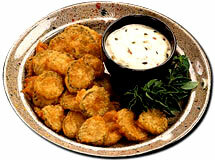 Scoff if you will, but the Fried Pickle is god’s gift to mankind. At home I have been known to snack on pickles cheese and mustard, heart fluttering with delight, but the Fried Pickle is in a class all its own. The crunchy, slightly sweet crust married with the hearty dll interior is a combination not to be missed. On this most recent venture, Fried Pickles accounted for 25% of my meal choices. Another solid 30% was filled by Fried Banana Peppers. On that first trip, you may wonder, did I give up the ghost and go for the bacon? I’ll never tell. But know this, my friends: if there are Fried Pickles to be had, I will eat them. Oh I will eat them all. This entry was posted on Wednesday, December 21st, 2005 at 5:16 pm and is filed under Uncategorized. You can follow any responses to this entry through the RSS 2.0 feed. You can leave a response, or trackback from your own site.